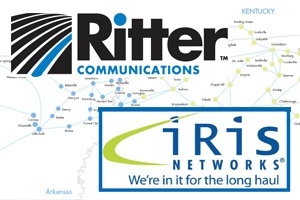 JONESBORO, AR – March 3, 2015 – Ritter Communications has partnered with iRis Networks to establish a fiber Ethernet interconnection which combines the capabilities and reach of both networks. The combined network allows for fiber based broadband connectivity to over 100 rural markets in Arkansas, Alabama, Kentucky, Oklahoma and Tennessee. Additionally, this interconnect allows for broadband connections to key regional locations such as: Knoxville, Nashville, Chattanooga, Huntsville, Paducah, Bowling Green, Little Rock and Jonesboro, as well as direct and diverse connectivity to several national locations such as Atlanta, Memphis, Chicago, Oklahoma City, Tulsa, Fort Worth and Dallas. Bringing end to end broadband speeds from 1Mbps to 10Gbps to over 100 rural and urban markets along unique routes. Enabling ILEC’s, CLEC’s, and cable providers to connect their infrastructure, access cost effective internet access, and partner on national and regional connectivity projects. Expanding the broadband footprint for anchor institutions such as healthcare, financial, and higher education across Oklahoma, Arkansas, Tennessee, Kentucky and Alabama. Enhancing the resiliency and reach of the national and regional FTTC (fiber to the cell) projects that are currently taking place. This network partnership will serve customers ranging in size from small to enterprise level businesses, as well as regional telecommunications providers with capacity from 1Mbps to 10Gbps and greater. To see a map showing the combined network footprint, please click here. You can also visit www.rittercommunications.com or http://iristransport.com/ for more information. iRis Networks is the sure choice for a wholesale carrier’s carrier delivering state-of-the-art, high-speed transport for voice, video and data in and around Tennessee. IRis is a uniquely positioned company providing a gateway to broadband transport to many underserved rural areas of the state. Using the latest technology, known as Dense Wavelength Division Multiplexing, iRis also provides fully redundant high capacity transport between the larger Tennessee markets of Nashville, Knoxville, Chattanooga and Huntsville, Alabama.